Botanica's Recent Posts Grid keeps your website fresh by automatically updating photos as you blog. Add as many columns or rows as you like, there's no limit! Botanica offers the option of a Static Home Page, a perfect way to introduce your work, as well as provide navigation links to essential pages of your site. It's full width masthead showcases your best photography with a clean and modern approach, while the Welcome Section Template below it serves as a perfect place to add SEO meta data. The Recent Posts Grid dynamically updates new posts as you blog, refreshing your site as often as you update! Botanica is capped with another menu button area for useful quick links, as well as an organized Footer, perfect for contact and location information. With Botanica, any ProPhoto Feature goes! It's made to be versatile to your specific needs. You are not locked into any particular design element, page layout or website structure. If you want your blog posts to be on your home page, it's possible! If you want the Recent Posts to be Categories instead, you got it! With Botanica's unlimited amount of customization and ProPhoto's countless features, the sky's the limit! Keep things fresh and organized! Botanica includes three complimentary Post Layout Templates to add interest to your blog photos and ensure that your branding looks great all across the board! Don't feel limited by these three layouts, we offer additional Post Layout Templates in the RMY Template Shop or feel free to create your own! Simple instructions for Botanica's Photoshop Templates are included to thoroughly guide you through the customization process! Feel free to change fonts, colors and photos to help make this design your own! Red Met Yellow's Botanica has more features and options than ever, complete with a Static Home Page Template, an About Page Template and a Full Width Masthead Image. It's multi-option features offer a variety of versatile layouts that will continue to keep your website looking fresh! Botanica supports all of Squarespace's Features, making any combination you come up with completely possible! 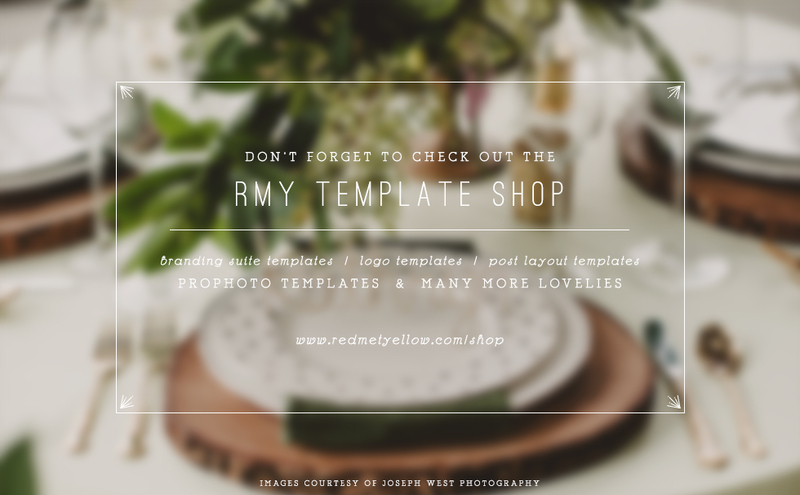 Be sure to check out the RMY Template Shop, featuring multiple Branding Suite Templates, Logo Templates, Post Layout Templates, ProPhoto Templates and many more lovelies! Shop now at www.redmetyellow.com/shop!